THE DEAD SEA SCROLLS by RW Bro. LEON ZELDIS Hon.A.G.M., Grand Lodge of Israel. During centuries, the only known references about the Essenes were a few brief mentions in the writings of Plinius, Philo and Flavius Josephus. Only in April 1947 this situation changed, when an Arab shepherd, looking for a stray goat, found several large ceramic jars hidden in a cavern, up the hill near the northern shore of the Dead Sea. The jars contained some rolls of parchment wrapped in cloth. These are the famous Dead Sea scrolls, which since their discovery and decipherment have cause a profound revolution in the thinking about the history of the Jewish religion in the crucial period of early first century of the C.E., and thrown new light on the origins of Christianity. Later searches in other near-by caves resulted in the discovery of other rolls and numerous parchment fragments. The total number of scrolls, when they were intact, is estimated to have been over one thousand; until now, 870 different parchments have already been identified. The fragments differ in size, some of them are no larger than a thumbnail. In one cavern alone (N° 4) some 15,000 fragments were found. Although we refer to the Dead Sea manuscripts as parchment scrolls, some were written on papyrus, and one is written, or rather incised, on a copper foil. This is the scroll that describes the hiding places of the Jerusalem Temple’s treasures, removed from the Temple by the priests in Bar Kochba’s time, to save them from the Roman legions led by Titus. The scrolls are written in several Semitic languages, although for the most part in Hebrew. An important point to remember is that until the discovery of these scrolls, scholars were of the opinion that in the beginning of the Christian era Hebrew was a dead language, used only by the educated few, such as Latin was in the Middle Ages of Europe. The Rabbinical Hebrew used in the literature of the years 200 and later was regarded as a scholastic invention, not a language of daily use. This belief led historians to conclude that the Gospels could not have been written originally in Hebrew or Aramaic. The discovery of the scrolls refuted these opinions. It became clear that the Jews of the Second Temple period (after the return of the Babylonian exile) used simultaneously both Hebrew and Aramaic. These two languages are closely related. In writing, however, the ancient Hebrews preferred using the Biblical language, that is Hebrew. The history of the discovery of these documents and their vicissitudes until finding suitable repository at the hands of archeologists could serve to write a novel. I shall try to summarize very briefly the main course of events. As already mentioned, at the end of Spring of 1947, some Bedouin shepherds of the Taamire tribe discovered by chance the jars containing scrolls. One of the parchment bundles, later denominated the “Isaiah Manuscript”, was offered for sale to an Arab antiquities merchant in the town of Bethlehem. To understand what happened then we must remember that at the time Palestine was still under the rule of the British Army, while the United Nations discussed the fate of the British Mandate that was reaching its conclusion. There was still contact between the Arab and Jewish communities in Palestine, but venturing into certain sectors had become hazardous, and violent confrontations were becoming more frequent from day to day. the Syrian Orthodox Metropolitan (equivalent to an archbishop) of the Saint Mark monastery, in the old city of Jerusalem. After a short while, the archbishop, Monsignor Atanasios Samuel, bought four of the scrolls. He then showed them to several persons, among them some members of the Biblical and Archeological College of the Dominicans, in Jerusalem, who also considered the manuscripts as being of recent origin, and having little value. Around the month of August of 1948, Bishop Samuel informed a Jewish physician, Dr. Brown, about the discovery of the scrolls and asked his opinion, Dr. Brown communicated this information to Professor Yehuda Magnes, President of the Hebrew University of Jerusalem, who in turn transmitted the news to the University Library and asked that some manuscript experts examine the scrolls. Two envoys from the University Library visited the Syrian monastery and the bishop showed them some of the manuscripts, not revealing their source. The library clerks, after examining the manuscripts, concluded they lacked the necessary expertise to determine their antiquity, and proposed a further examination by somebody better qualified for the task. However, before the Hebrew University could send its experts, Bishop Samuel decided to return to Syria, taking the scrolls with him. That took place during a turbulent period of armed struggle between Arab and Jewish groups, resulting in numerous casualties. Let’s go back in time. On 25 November 1947 a Jerusalem antiquary showed to Professor Eliezer Sukenik, of the Hebrew University, a parchment fragment written in the old “square” Hebrew alphabet, which Sukenik immediately identified as similar to the inscriptions on sarcophagi dating from the Hashmonean era, that is, the two centuries before and the first century following the birth of Jesus. To make the story short, on 29 November Sukenik bought three parchment rolls, and also two of the ceramic jars that contained them. On that same day, the United Nations voted the end of the British Mandate and the partition of Palestine. Arab armies immediately invaded the country from all sides, and Israel’s war of independence started. This caused the complete break of relations between the Arab and Jewish communities in Palestine. Nevertheless, Professor Sukenik succeeded in maintaining contact with the Arabs involved in the matter. At that time, one of the workers in the University Library related to Professor Sukenik the episode with the Syrian archbishop, and Sukenik immediately realized that those parchments had the same origin. He tried to visit the Monastery of Saint Mark to examine the manuscripts, but the monastery was already cut off from the Jewish sector of Jerusalem and travel between the two sides was impossible. At the end of January 1948, Sukenik received a message from Anton Kiraz, a member of the Syrian community, who communicated that he had in his possession several old parchments and wanted to show them. Sukenik managed to find a neutral place to meet with Kiraz. After some negotiations, they finally met in the Y.M.C.A. building, close to the Old City but still within the Jewish sector. When Sukenik examined the scrolls brought by Kiraz, he realized they belonged to the same group of those he had already purchased. He took three of the scrolls to be examined by other experts, and they all concluded they were authentically old. A protracted negotiation now started to purchase the scrolls. David Ben-Gurion, then President of the Jewish Agency, and later Israel’s first Prime Minister, was approached and his approval was secured to allocate the necessary funds, although the war made more urgent demands on the scant resources of the Jewish population. Meanwhile, however, the Syrian Orthodox decided to wait until the end of hostilities, to get a better price, and then, through the American College of Oriental Studies in Jerusalem, the manuscripts were transferred to the United States. On 11 April of that same year (1948) a publication in the United States disclosed that the Americans scholars in Jerusalem had identified for the first time some of the Dead Sea manuscripts as belonging to a period preceding the destruction of the Jerusalem Temple, in the year 70 C.E. This news evoked great interest in scientific circles. Sukenik then decided to publish a first study on the parchments, a booklet that appeared with the title “The Hidden Scrolls” (Hameguilot Hagnuzot). To conclude this story, Professor Sukenik purchased three scrolls, while his son, the archeologist and army general Yigael Yadin, eventually bought in New York the four scrolls owned by he Syrian archbishop. An eighth scroll, the important Temple Parchment, was purchased by Yadin after the end of the Six Days War of 1967, when Jerusalem was finally reunited. The seven original scrolls are now exhibited in the Museum of the Book, part of Jerusalem’s Israel Museum. They are the following: Manual of Discipline, presently known as Character of a Sectarian Jewish Association, Histories of the Patriarchs, Psalms of Thanksgiving, A Commentary on Habbakuk, the War between the Sons of Light and the Sons of Darkness, and two copies of the book of Isaiah. Apart from the scrolls, as I mentioned, thousands of parchment fragments have been discovered, whose translation and publication has taken many decades and caused sharp disputes in scholar circles. They are kept at present in Jerusalem’s Rockefeller Museum, and their publication has been completed only recently. The antiquity of the Dead Sea scrolls was conclusively proven when some samples were tested in April 1991 in a Swiss laboratory, dating them around the beginning of the Christian era. Archeologists, basing themselves on the writing, had already reached the same conclusion, that the parchments could not be later than the year 68, when Roman legions reached Qumran and the settlement there was liquidated. The importance of the scrolls for our understanding of the evolution of Rabbinical Judaism in that crucial period of the end of the Herodian rule, the destruction of the Jerusalem Temple and the birth of Christianity cannot be overstated. The last section of the Hebrew Bible, the Book of Daniel, dates to about 150 B.C., while the earliest Rabbinic writing is the Mishnah, redacted in about 200 A.D. The period between these two dates was a blank hole until the discovery of the scrolls. A measure of their importance for scholarship can be judged by the number of Dead Sea Scroll studies published. A bibliography of publications between 1970 and 1995 lists about six thousand items. Approximately a quarter of the Dead Sea Scrolls are biblical manuscripts, including fragments of every book of the Hebrew Bible except Esther. What interests us in to take a look at the content of the scrolls, written two thousand years ago, and to advance some theories about their possible connection with Masonic legends and traditions. First, let as learn something about the people who wrote the scrolls, the circumstances when they were written, and this will help us to judge their significance. Near the caverns where the scrolls were found are the ruins of Qumran, a structure that has been identified by archeologists as the first known monastery in the Western world. There is little doubt that the place was inhabited for a long period of time, lasting over a century. The first archeologist to make scientific excavations in the place, Father De Vaux, of the Biblical School of Jerusalem, arrived to the conclusion that this was a meeting place for the Essenes, and since the settlement is not very large, De Vaux assumed that most of the members of the sect lived in the nearby caves, and came down to the main building only to meet, shared the meals, take ritual baths and pray together. In the course of years, this theory was disputed by other researchers, but the latest discoveries of archeologist Magen Broschi (who was for many years Curator of the Dead Sea Scrolls in the Israel Museum) and Dr. Hanan Eshel of Bar-Ilan University, confirmed irrefutably De Vaux’s assumption. These archeologists discovered paths leading from the Qumran ruins to the caves, and found there 2000-years old sandal nails, as well as coins of the epoch and pottery. 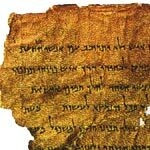 Who were the inhabitants of Qumran, who wrote or preserved these parchment documents in the Dead Sea caverns? The Essenes were one of the minor factions of the Jewish people in the Hashmonean period. The main groups, as we know, were the Pharisees and the Saducees. After the conquest of the Middle East by Alexander the Great, and after his death in the year 323 B.C.E., Palestine became a battleground between two of his generals: Seleucus, who governed Syria, and Ptolomy in Egypt. A descendant of Seleucus, Antioch Epiphanes IV, tried to impose paganism on the Jews, introducing the cult of Zeus and the other Greek gods. This resulted in the revolt of the Maccabees in the year 165 B.C. After a cruel war, the Jews, under the leadership of Judah Maccabee (Maccabee in Hebrew means “ The Hammer”) defeated the Greek generals and achieved independence. Although Judah Maccabee died in battle, his descendants, beginning with John Hircanus, continued the Hashmonean dynasty, marked by continuous fraternal wars and the growing menace of Roman power. It was in this tempestuous period of history that the Essenes separated themselves from the main current of Judaism, constituting what today would be called an ultra-orthodox sect. The considered that the end of the world was near (the apocalypses), and they tried to observe strictly all the prescriptions of the Torah, that is, the Pentateuch, the first five books of the Bible. Some writers indicate that Saint John the Baptist may have been a member of the sect, and even Jesus has been mentioned as a possible member. The name Essene (issi in Hebrew) means pious. The Essenes were ascetic, practicing frequent fasts and daily ritual baths. They studied the holy writings assiduously and they conducted themselves democratically. Among the Dead Sea scrolls there are two, in particular, that throw light on the organization and principles of the Essenes. This is the scroll called “Manual of Discipline” and the "Zadokite Document”. The first is included among the Qumran scrolls, while a copy of the second was discovered at the end of the 19th century by Solomon Schechter in the Gnizah (storeroom) of the Ezra synagogue in Fostat, the old quarter of Cairo. It’s a known fact that old Hebrew religious texts are not destroyed, because the name of God appears on them, but they are stored in a special repository or storeroom of the synagogue, the Gnizah. We shall now examine some of the rules of the Dead Sea community, and decide whether they bear some resemblance to Masonic traditions. When a person desired to join the community, that they themselves called the Yahad (Together), he had to undertake to respect God and men, practice virtue and avoid evil. This is quite similar to a passage in the opening ritual of the lodge in the First Degree of the Scottish Rite. When the question is asked, for what purpose are we assembled, the answer is “to raise temples to Virtue and dig dungeons to vice”. Also, in the initiation ritual the candidate is enjoined to choose the path of virtue and not that of vice. The statement of belief in the Supreme Being is also a required part of the initiation ceremony. The community examined the background of the candidate, his character, and his fulfillment of religious precepts. Each person was then inscribed in a particular rank, coming under the authority of a superior. Believers were known as the Children of the Light. [Weiss, Abegg, Cook, p. 125] This is an important detail. Masons are also known as “Children of the Light”. The followers of Jesus are likewise referred to as “the sons of the light” (John 12:35-36). In the parable of the unjust steward, Jesus also spoke of the “sons of light”. We must remember that the Gospels of Luke and John were composed about two hundred years after the Manual of Discipline. Receiving the light is the crucial point of the initiation ceremony. The sun, and its light, plays a prominent role in Masonic rituals, the sun and the mon, symbols of day and night light, are displayed prominently in the Masonic temple. At the crucial moment of the initiation ceremony, after the candidate pronounces his solemn oath, he is asked what is his most fervent wish. His answer (instructed by his conductor) is: Light! In the Yahad, when the candidate was initiated in the community, the priests pronounced a special blessing. The members of the community were divided into three classes: the priests (Cohanim), Levites and the people. This brings to mind the division between Apprentices, Fellow-Crafts and Master Masons. Every year, the progress of every member of the community was assessed, from the oldest to the youngest initiate. Each one was classified anew, “so that no one may be reduced in his state or exalted above his appointed place”. This is also the tradition in Lodge, where the Brethren take their seats according to their degree, and in the Scottish Rite lodges, they are granted the right to speak also following a set order determined by rank. In the community’s debates, all could take part, following their order, but no one could interrupt another, nor speak before his turn, according to his rank. Nobody could speak about matters other than those of interest to the entire community. This reminds us of the procedure of Masonic debates, and the “raisings”, or “General good” part in the ritual, when the brethren are invited to speak up. If a person wanted to join, he was interrogated by the Superintendent concerning his intelligence and his behavior. Then, if considered suitable, he was presented to the general assembly, where every one gave his opinion, and his admission or rejection was decided by vote. One of the rules concerning admission to the community specifies that “no person with a physical defect, crippled on both legs or arms, lame, blind, deaf, dumb, or having a visible physical defect, can join”. A similar restriction appears in the old Masonic documents. If the candidate was accepted and took an obligation to comply with the rules of the community, he was admitted on trial for a year, during which time the initiate could take part in the discussions only as an Observer. After this first year, he was again examined to verify his progress. If this was considered adequate, he was allowed to continue for a second year, but then he had to bring his belongings and the tools of his trade, which were turned over to the “Minister of Work” for safekeeping. Only after the second year, following a further examination, he was formally accepted, sworn in and inscribed in the register of the Brethren of the Community. This succession of trial periods and examinations are reflected also in the practices in our Lodges. The candidate is examined before initiation, and later, before advancing to each further degree. The neophyte had to imitate the purity of his masters, that is, practice the rules of decency and walk in perfect sanctity. He undertook to follow a long road in search of enlightenment. The congregation counted twelve brothers and three priests well versed in the Law, called “of perfect sanctity”. This brings to mind the three “pillars” of the Christian church: James, Cephas and John (Galatians 2:9) and the twelve apostles. Of course, the numbers three and twelve appear frequently in Masonic rituals. In the Scottish Rite lodge the Master and the two Wardens are called the “lights” of the Lodge. The Royal Arch meets under the banners of the twelve tribes of Israel, etc. An interesting passage is the following: “They [the members of the community] will be a precious cornerstone”. This phrase recalls verses 16-17 in chapter 28 of Isaiah: “Behold, I lay a stone in Zion, a tested stone, a precious cornerstone for a sure foundation... I shall make justice a measuring line and righteousness the plumb line”. In Masonic initiation, the neophyte is placed in a particular position within the lodge and told that he is regarded as the cornerstone of the ideal Temple we are building. Furthermore, an entire Masonic degree (Mark Master) refers specifically to the cornerstone. The measuring line in verse 17 is no other than a ruler, or it can be taken as representing the level, while the plumb line is the perpendicular. Both symbols of the Wardens. After the Council meetings, that ended with public confession and a new collective blessing to the newly initiated, they devoted themselves body and soul to the Great Work, to fulfill the congregation’s statutes (Numbers 15:15: “The community is to have the same rules ... this is a lasting ordinance for the generations to come”). The Masters inculcated in their disciples mental discipline so that they could distinguish between good and evil, between light and darkness (cf. 1 Kings 3:9: “So give your servant a discerning heart to govern your people and to distinguish between right and wrong”. This lesson is imparted to the candidate during the Masonic Initiation ceremony, more specifically in the 1st Degree ritual of the Scottish Rite, when the candidate is made to sip a sweet drink, that later turns bitter. They also taught the principles of morality, tolerance and human solidarity. These are mainstays of Masonic teachings. The masters also inculcated liberal and democratic ideas, to walk the path of honor and justice, to defend the innocent and the downtrodden, to protect the widow and the orphan, and above all, to assist the needy. All these are precisely the virtues close to the hearts of Masons. They also taught to dedicate themselves to work, combining individual effort with meditation and study, to achieve a high level of wisdom within a fraternal and just society. The members of the sect were educated in the art of meditation, reflecting on the meaning of life and the notion of loving one’s neighbor. It is interesting to note that in the Qumran ruins have been found numerous stone vessels. Stone, according to Jewish religion, because it is a natural material, not adulterated by human transformation, such as the firing of clay, is no ‘contaminated’ by the food, and therefore does not have to be ritually cleansed, like earthen or metallic vessels. The initiates, whose ages varied between 25 and 50 years, learned to “love justice and abhor evil”. They regarded themselves as heirs of the priest kings, symbolized by Melchizedek and Solomon. Some, like John the Baptist, made a vow as Nazirites. They must not be confused with the Nazarenes, those natives of Nazareth. The Nazirite (from “nazir”: separated or consecrated) consecrated himself fully to pious practices during a given period of time; he then abstained from wine or any fermented drink, did not eat grapes or raisins, did not shave or cut his hair, and could not come near a corpse, not even of his closest family. When his period of separation had ended, he had to come to the entrance of the Tabernacle and present an offering to the priest. Then, the Nazirite cut his hair, could drink wine and bathe himself. The Zadoquite Document contains a special section on the functions of the “mefaqueah” or “Supervisor”. The Hebrew word “mefaqueah” is the exact equivalent of the Greek “episkopos”, which is the origin of the word “bishop”. The Supervisor was charged with educating the people, and make them understand the works of God. He had to explain in detail the history of the past and show to them the same compassion that a father shows to his children. He also had to examine each neophyte regarding his conduct, intelligence, strength, courage and possessions, to give him the appropriate rank. His function was, in great measure, equivalent to that of the Wardens in a Masonic Lodge. Finally, I would like to mention that some Jewish writers maintain that a section of the Essenes was called the Banaim, that is, the builders. It is not known why they were called with that name, but there is a reference in the Talmud that “the Masters in Israel are Builders (banaim)”. From all this, we shouldn’t jump to the conclusion that Masonry may be a successor of the Essenes. The points of coincidence we have noted are significant, but do not prove filiation. What does appear evident is that both the Essenes and the speculative Masons obeyed certain norms of conduct shared by all human beings who have reached a certain stage of spiritual development. The writer Aldous Huxley, in his book The Perennial Philosophy, presents a good argument to demonstrate the coincidence of mystic traditions in different times and cultures. The Dead Sea manuscripts are much more extensive than what I have described here. There are interesting passages about the end of time, Biblical commentaries, hymns of praise, and much more. My purpose has been to focus only on some aspects of coincidence with Masonic rituals, particularly the Ancient and Accepted Scottish Rite, that has received and kept major influence from esoteric traditions, alchemy and Cabbala. Freemasonry was not born in one piece, like the goddess Athena, but rather developed in an evolutionary process, absorbing symbols and legends from various sources. The Essenes, though distant in time and space, appear to have been one of the remote precursors of our Royal Art. Josephus, Flavius, Antiquities and Wars of the Jews. Gaster, Theodor H., The Dead Sea Scriptures. Luria, Ben-Zion, Meguilat Hanejoshet Mimidbar Yehuda(In Hebrew: The Copper Scroll of the Judean Desert), Jerusalem, 1963. Vermes, Geza, The Dead Sea Scrolls in English, 3rd ed., London, Penguin, 1990. Shanks, Hershel, The Mystery and Meaning of the Dead Sea Scrolls, Vintage Books, New York, 1998. Sukenik, Eliezer, Otzar Hameguilot Hagnuzot (in Hebrew: Collection of the Hidden Scrolls). Sussman, Ayala and Ruth Peled, Scrolls from the Dead Sea, Library of Congress, Washington, 1993. Wynn Wescott, W., “Freemasonry and its relation to the Essenes”, Ars Quatuor Coronatorum, Vol. 28 (1915), pp. 67-79.